Cabin #1 is a quaint two bedroom cottage with a sunroom, which includes a wicker love seat and chair, and dining table and chairs. The master bedroom has a full size bed and the second bedroom has two twin beds and a TV with DVD player. The cozy eat in kitchen is fully equipped with a stove and microwave. The cabin is nestled in pine trees with private picnic table and chairs and a charcoal grill to barbeque the catch of the day. 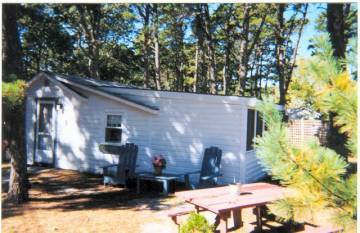 Easy access to local ponds, ocean and bay beaches and bike trail. Absolutely no pets or smoking. Available May – October. 2005 rates range from $500 - $675.